Dietary iron is in two forms, heme and non-heme. Animal foods have 40% iron as heme iron and 60% as non-heme iron. Plant foods contain only non-heme iron. Most of the iron available for absorption comes from non-meat sources even in meat eaters. The widely held perception that vegetarian diets contain less iron than meat eaters is not true. Vegetarian diets contain as much or more iron than meat diets (MJA Open 2012; 1 Suppl 2: 11-16). Vegetarian foods have less heme iron. Different pathways absorb heme and non-heme iron. Digestion of proteins releases heme which is oxidized to haemin and absorbed by the enterocytes. A receptor for the absorption of heme has been postulated but not identified. Once within the cell the haemin is acted upon by heme oxygenase 1 to release the iron. The heme iron is added to the enterocyte iron pool and follows the same path out of the cell as non-heme iron. Food does not affect the absorption of heme iron. Some heme may be absorbed directly and is bound to hemoprixin. Dietary non-Heme iron is present in the ferric state. Ferric iron is insoluble and needs to be converted to the more soluble ferrous state for absorption. The reduction of ferric iron is aided by the acidic environment of the stomach, dietary components like ascorbic acid and duodenal cytochrome b (Dcytb). Dcytb does not appear to be essential for iron absorption. Ferrous iron is absorbed by the divalent metal ion transporter (DMT1). In addition to Fe2+,DMT 1 also transports Mn2+, Co2+, Ca2+, Zn2+, Cd2+ and Pb2+. DMT1 is expressed at the brush-border of the enterocyte near the tips of small intestinal villi. DMT1 needs protons to co-transport with iron. Protons come from the gastric juice and are most abundant in the duodenum. Most of the iron is absorbed in the duodenum. Antacid, H2 antagonists and proton pump inhibitors hamper iron absorption by reducing hydrogen ion availability. All these drugs have been shown to impair the efficacy of medicinal iron. The absorption of non-heme iron, unlike heme iron, is affected by food. Foods enhancing iron absorption: Ascorbate, animal proteins, human milk, keto sugars, organics, amino acids that form soluble chelates with iron enhance absorption of non-heme iron. Iron is transported to the lamina propria by an iron transporter ferroportin. Ferroportin transports iron in the ferrous form. This needs to be oxidized to the ferric form for binding to transferrin. 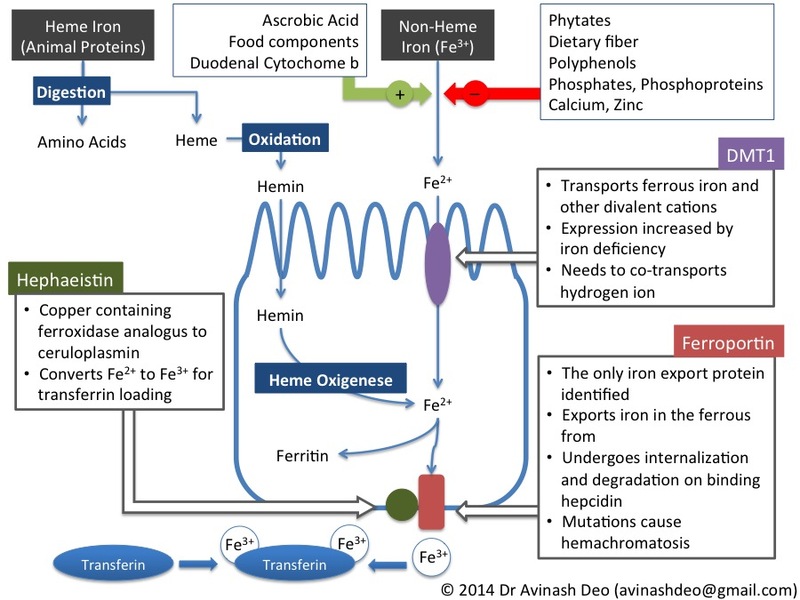 Hephaestin oxidizes ferrous iron to ferric iron. Ferroportin is the key to controlling body iron. In iron deficient state ferroportin expression at the basolateral surface of the enterocyte is increased and more iron is transferred to the blood. When the body is iron repleted ferroportin expression is low and the iron remains in the enterocyte as ferritin. Iron stored as ferritin is lost with the enterocytes when it is shed at the end of it’s lifespan of 5-6days. Ferroportin levels are controlled by enhancing it’s degradation when iron stores are adequate. The liver, on sensing adequate iron stores, secretes a peptide hepcidin that binds to ferroportin. Binding of ferroportin to hepcidin causes internalisation and degradation of ferroportin preventing iron transport. Mutations ferroportin, hepcidin and molecules that promote the secretion of hepcidin (haemachromatosis protein (HFE), haemojuvelin (HJV), transferrin receptor 2 (TFR2)) result in increased iron absorption and haemachromatosis. Mutations in TMPRSS6 a negative regulator of hepcidin results in iron refractory iron deficiency anaemia.